This “BREAKING BAD” artwork was originally commissioned by The Onion’s A.V. Club for the cover of “Buy The RV, We Start Tomorrow,” The A.V. Club’s Guide To Breaking Bad, (in 2011). Now for a limited time, signed prints of this artwork are being made available by the artist, Danny Hellman. This is a brand new 11 X 14 full color Giclee print on archival paper, signed by Danny Hellman. 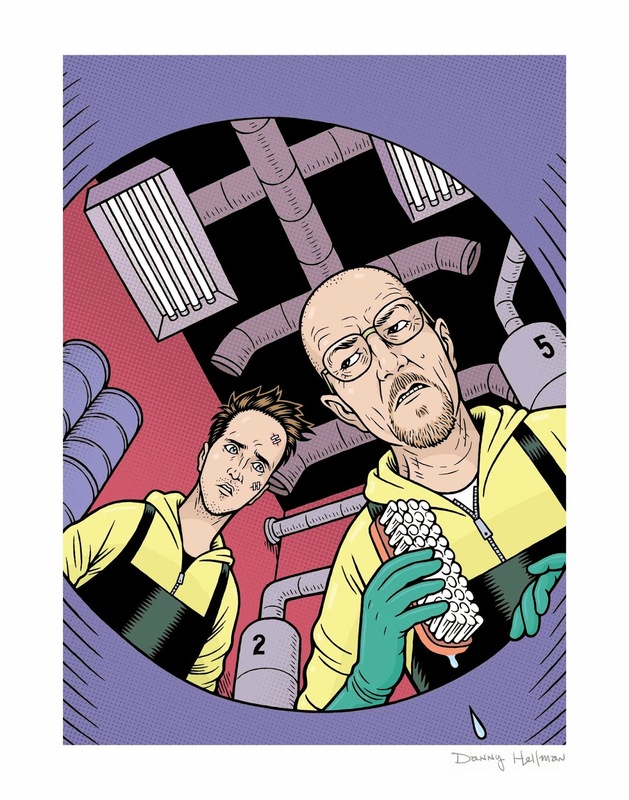 This print is a must-have for fans of Breaking Bad and it’s principal actors, Bryan Cranston (Walter White) and Aaron Paul (Jesse Pinkman). This art print is in mint condition, and will be shipped via US Mail in a sturdy cardboard mailer. This is a high-quality Giclee art print, not a color Xerox or other non-archival cheapo print. Quantities are extremely limited, so buy now! Danny Hellman is an award-winning, internationally-known illustrator whose work has appeared in a wide variety of venues, including TIME, NEWSWEEK, FORBES, FORTUNE, SPORTS ILLUSTRATED, THE LATE SHOW with DAVID LETTERMAN, THE WALL STREET JOURNAL, DC COMICS, MAD MAGAZINE, and SCREW.